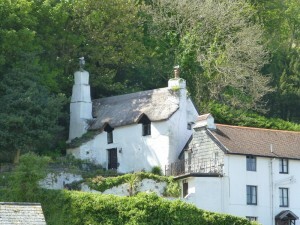 I know David has already blogged about this gorgeous old cottage in Lynmouth that we both sketched on our recent course for Alpha Painting Holidays but I cannot resist also featuring it in this, my first blog for some time. Circumstances have prevented me finding time to blog lately but it is time to rectify that. Those of you who know me are aware that old buildings in the landscape are my favourite subject and our recent trip to Exmoor gave me the perfect opportunity to seek out some of the best examples in the UK. 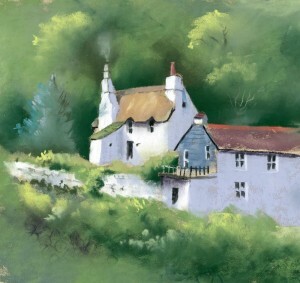 This old cottage, perched high on the hill above Lynmouth harbour, seemed to almost grow out of the hillside giving it a timeless feeling. The watercolour sketch I did included a number of the other cottages which descended the hill towards the harbour but for the final painting, which was done as a demonstration for the painting course, I decided to leave out the majority of the buildings and to focus on the one that interested me the most. The direction of the light in the photograph was confused by shadows cast by the trees so I decided to simplify things. 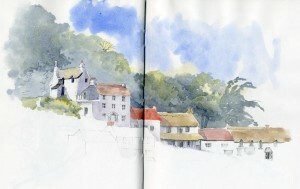 The background and foreground were suggested with colour rather than detail. I will be demonstrating a building in the landscape in pastel at the Sandpiper Studio on the Wirral on Friday 20th June, 2pm – 4.30pm, (scroll half way down the page for this event details) tickets are still available at £13 per head including refreshments from Julie McLean, booking details are here. This entry was posted in Jenny Keal Blog, pastel, pastel painting by David Bellamy. Bookmark the permalink. It is great to see a blog from you again. Nice painting!